As I have mentioned, to me this capacity has a lot in common with the second one. I have been trying to figure out the difference and really it comes down to one word found in this, the fourth capacity, that isn't found in the other one; that word is "mentor". And I think that is why I find myself more drawn to this capacity. I have always loved sharing with others, and over the past year, I feel I have really taken on the role as teacher leader and have started to really mentor other teachers: at my school, in the district and more recently, even outside of my school district. Yesterday, I mediated my very first twitter chat. 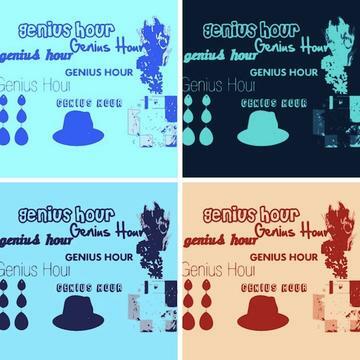 I promoted it for about a week using the hashtag #geniushour and other educational hashtags and then spent an hour mediating a conversation about using Genius Hour in the classroom. It was so exciting! I loved being able to share my successes (and my lessons learned the hard way) with teachers across N America. I also started a wiki yesterday so that educators can share documents and experiences regarding Genius Hour as well. It has been an exciting year for me! creating a class website & shared with the rest of the staff ay my school what I have already accomplished within my field study. Since my presentation it is my understanding that many more divisions have class websites now.